These vials show the lethal dosage of each drug. As you can see Carfentanil is significantly more potent. At a press conference Tuesday, Governor Chris Sununu delivered some grim news: carfentanil, a powerful new opioid, has been linked to two deaths in Manchester. Hours later fire officials in the city were preparing. 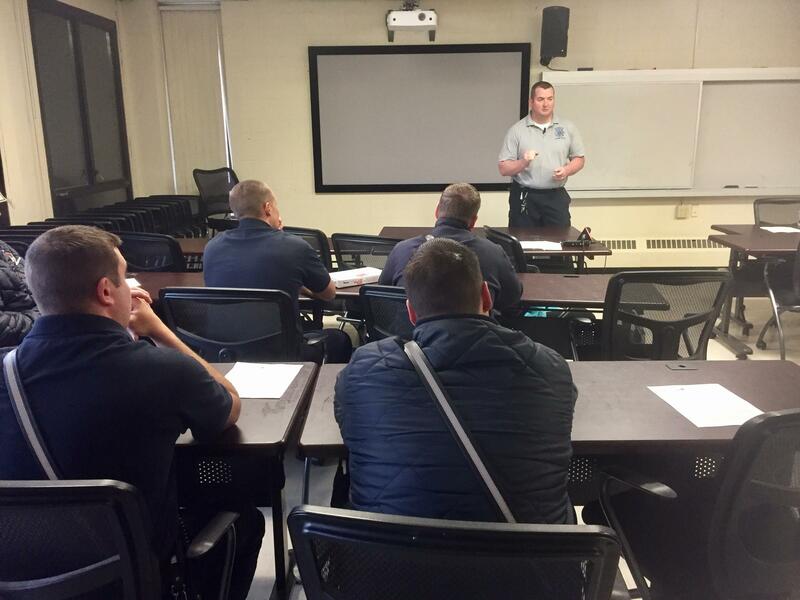 "Just be hyper, hyper vigilant of what is out there, hyper vigilant of where you put your hands, what you come in contact with," Manchester Fire's EMS Director Chris Hickey told the city's firefighters during one of his two training sessions Wednesday. This kind of drug is unlike anything they’ve dealt with before. It’s designed to be used as a tranquilizer...for elephants. And its lethal dosage is 20 micrograms, which is as tiny as a snowflake. Even getting it on your skin could be deadly. Chris Hickey, who's the EMS Director at Manchester Fire, trained the city's firefighters on how to treat overdoses with Carfentanil now on the streets. “There is nothing out there other than going in in hazmat suits on every single overdose that is going to completely protect us. We just have to be super, super careful with it,” Hickey told his men. And treating overdoses – isn’t too simple either. Hickey says in the past few weeks his guys have had to use 6 to 8 doses of the overdose reversal drug Narcan to revive someone, which is more than twice the normal dose. Dr. William Goodman is the CMO at Catholic Medical Center in Manchester where they treat overdoses on a daily basis. Now that Carfentanil is in the picture – he says Narcan may not be enough to do the trick. “Usually Narcan is stronger than heroin so it out-competes and it blocks the receptor and heroin can’t trigger the new receptor and that is how it works. But Carfentanil is so strong it out-competes the Narcan, so it would really be an arms race – of the drug versus the antidote," Goodman said. But Goodman says he isn’t aware of any other antidote on the market. So for now – multiple doses will have to do. "There is nothing out there other than going in in hazmat suits on every single overdose that is going to completely protect us," said Chris Hickey, EMS Director of Manchester Fire. There’s no shortage of Narcan but the state will likely need a lot more, not just to treat drug users but also first responders, who may need it in case of exposure. New Hampshire is the first New England state to have Carfentanil. But it’s been found in about a dozen other states across the country. The drug originates in China, and first responders in New Hampshire say you can simply buy it online. But whether that’s how it’s getting into New Hampshire - is a mystery. Stephanie Bergeron heads the treatment center Serenity Place in Manchester. She says her patients started seeing this drug weeks ago. They’ve said dealers even have been giving it out for free. “I think they are nervous because they don’t know – they think they could even be buying fentanyl and it could be something else or the heroin is cut with like it was before with fentanyl and now it is heroin cut with Carfentanil. They may be cautious with using less but even less is deadly,” Bergeron said. In the past week, Serenity Place has handed out more than 40 Narcan kits to their clients. And it’s making sure staff members carry them as well. 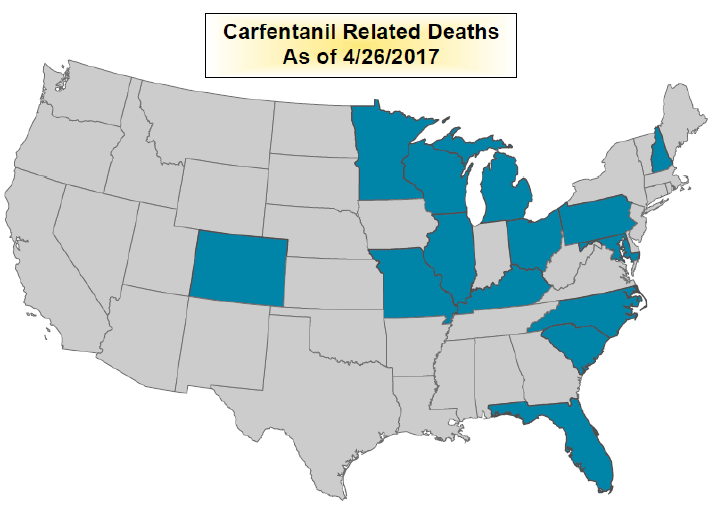 Currently 14 states have reported having Carfentanil. But New Hampshire is the only New England state so far. As of now reports of Carfentanil seem to be limited to Manchester. But first-responders in other places, like Franklin Police Chief David Goldstein – are all preparing their staff for its arrival. And the Director of the state’s Drug Lab Tim Pifer agrees. What Does It Mean to Have Carfentanil in New Hampshire? On Tuesday, public health officials confirmed the first cases of overdose deaths from carfentanil in New Hampshire. Carfentanil is a synthetic opiod and much more potent than the painkiller fentanyl. It can be mixed with heroin with deadly results. It can also be absorbed through the skin or accidentally inhaled, posing a risk to first responders and health workers. Carfentanil, One Hundred Times More Powerful Than Fentanyl, Confirmed in N.H.
Public health officials announced Tuesday that for the first time in New Hampshire, the synthetic opioid carfentanil was found in the blood of three residents who died from overdoses. The drug is approximately 100 times more potent than fentanyl, and is commonly used as a tranquilizer for large animals, including elephants. Speaking at a press conference, Governor Chris Sununu said the state’s forensic lab confirmed the presence of the drug earlier in the day.